NEWARK – Laid off from a trade show rental sales position twice last year, Kareem Davis, a single father living in the city’s Lincoln Park Arts District, somewhat begrudgingly applied for food stamps, becoming one of the 45 million Americans who receive the assistance. The program allows a $200 per month food stamp budget — $50 per week, just enough for he and his 10-year-old daughter to get by in addition to whatever work he can get as a freelance photographer. Davis’ concerns don’t end with a meager budget for food. He avoids C-Town in his neighborhood and, unable to afford the $10 cab ride from his home to the far more amenable Pathmark, he says he’d rather spend his own money on fresh produce from Trader Joe’s in Manhattan where he completes his photo assignments. Asked about the quality of the food where he lives, Davis is mostly dismissive. “I always have to check the expiration dates. [You should] actually smell the meat there. For his part, with the nobility of his intentions aside, Newark Mayor Cory Booker’s gamesmanship as it concerns a food stamp challenge with one of his followers on Twitter (@MWadeNC, who has declined to confirm her identity in media reports) has been a media sensation: a local politician with a national profile burrowing into the trenches with his city’s poorest. With the challenge set to begin Tuesday, news organizations, social media and Newark’s residents are abuzz about what he plans to accomplish by surviving on a food budget of no more than $5 per day for a week. HeÂ plans to chronicle his experience across his Twitter, LinkedIn and Facebook social network pages starting Tuesday and concluding on Dec. 11. 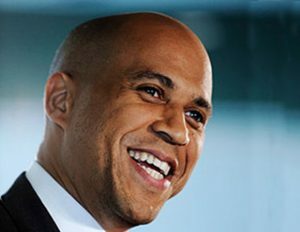 But despite his best intentions, opinions run the gamut; many are wary that Booker’s hands-on approach to governance will serve solely as a kind of political chicanery, or if he’ll really dig in to addressing the growing needs of people dealing with a nationwide problem. Calls to the mayor’s office for comment were not returned, but the mayor is not without his share of supporters. Damyn Kelly, executive director for Newark Emergency Services for Families, says he’s impressed with the mayor’s willingness to bring attention to the plight of families in Newark. NESF, which provides emergency food assistance to families and individuals in Newark, provides up to fifty bags of food a month to families in need. Due to the fallout after Hurricane Sandy, that number is up to 200.